THE HITCHIN power curve was preoccupied on the coach to Slough. Parking permits, the best pub for a pre-match beer and above all, the forthcoming friendly with an Arsenal development squad on November 10, were all setting the agenda. The curve was not complete though. Chairman Barratt was making his own way to Sir John Betjeman’s favourite destination and Big Len was making sure the tannoy was working for the prestigious midweek floodlight inauguration game with the Gunners. Lists of invited guests to Top Field appeared to be getting longer and predictions of the crowd were swaying wildly from four figures to an extremely hopeful (and alcohol influenced) 4,000. Somewhere in between would make “Mr Hitchin”, Roy Izzard, extremely happy, even though the admission price is a very progressive “pay what you want”, something that has worked well for Hitchin in the past. The mood on the coach was understandably upbeat, even though the day got off to a belated start as the “side locker” was not working on the vehicle. Slough isn’t far from Hitchin, but the M25 and M4 can be unpredictable. In recent years, Slough have been based at Beaconsfield, which was always a welcome trip for fans eager to travel to nearby Hedgerley for a pint at the White Horse. But for Slough fans, the club’s exile at the SYCOB’s ground must have been painful, especially as the “Rebels” were once a sizeable name in non-league circles. 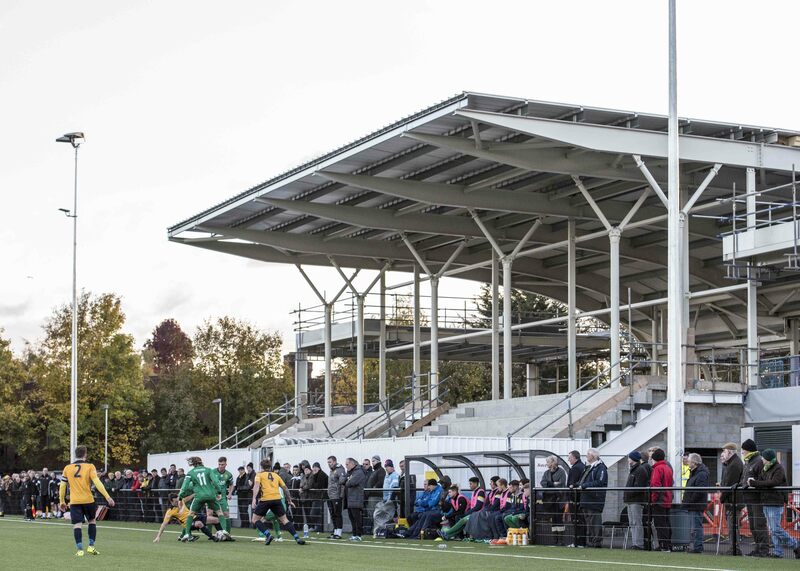 Most non-league fans will welcome Slough’s return to their home town – it not only shows that life can revert to normal at some point, it also demonstrates that local authorities can be sympathetic to football clubs. There’s nothing more disconcerting for a club that being homeless and there must have been times when Slough supporters feared for the future. It’s good news that they’ve gone home. Arbour Park is part of the local council’s Community Sports Facility (CSF) project and it is still work in progress. The ground has, wisely, had an artificial pitch installed and the whole concept really represents the direction non-league football should be heading. Slough, apparently, means “muddy place”, but the football team will have no problem with that with their state-of-the-art playing surface. I do worry about the grey material that sprays up when a ball is kicked on such pitches, however. From first glance, the facility looks impressive, with uniform accomodation, plenty of room and, once completed, a neat main stand. Once it has been finished, Slough will have a new home to be proud of. It was a reminder to Hitchin fans that, new floodlights aside, their own tenancy issues are still lurking in the background. With such a new stadium, Slough could really fly once more. This is a town with a big population – some 150,000 – and the potential for decent attendances. It’s a place that has been the brunt of jokes and jibes in the past – as mentioned Betjeman urged the Luftwaffe to drop their bombs on the industrial expansion that brought factories to Slough – and was one of the reference points for the Ricky Gervais comedy, The Office. But it has given the world some very notable people: Gerry Anderson of Thunderbirds fame was from Slough; British Prime Minister, Stanley Baldwin; Billy Smart of circus notoriety; Isambard Kingdom Brunel; and – whisper it quietly, Gary Numan and Geri Halliwell. On the face of it, Slough Town versus Hitchin Town was the “match of the day” in the Southern League Premier. Before kick-off, Slough were in second place on 38 points and Hitchin were in fourth on 33. Slough had lost twice all season in the league and were unbeaten at home. The Canaries were on a roll and had not lost for 11 games. The contest was very entertaining in places, reflecting the status of the two teams. Hitchin certainly started better, although their finishing could have been more incisive. Robbie Burns, who had an excellent 90 minutes, went close with a header when he met Matt Lench’s cross and then Lench himself should have scored when he rounded keeper Mark Scott and shot into the side-netting. But Slough were not without their chances and late in the first half, James Dobson struck a post with a free kick and on-loan striker, Elijah Adebayo (who netted a hat-trick on his debut against Bognor Regis in the FA Trophy), skied the rebound over the bar. Hitchin went in at half-time bemoaning their finishing, but four minutes into the second half, went ahead through Ben Walster, whose free kick curled in off the post with Scott beaten. Slough introduced Lewis Putman to the action, a left-footed striker who had a penchant for goalscoring in the lower leagues. Putman almost joined Hitchin but opted to go elsewhere a couple of years ago. He’s a tricky player when on form, highly dependent on that left peg. Slough certainly took advantage of Hitchin’s decision to play deeper and hold on to their lead. It almost invited an onslaught in the closing stages, but the Canaries keeper, Michael Johnson, was having a productive afternoon, notably when he pushed a Putman shot around the post. And as Slough threw everyone forward, including their custodian, Charlie Moone had a header cleared off the line. 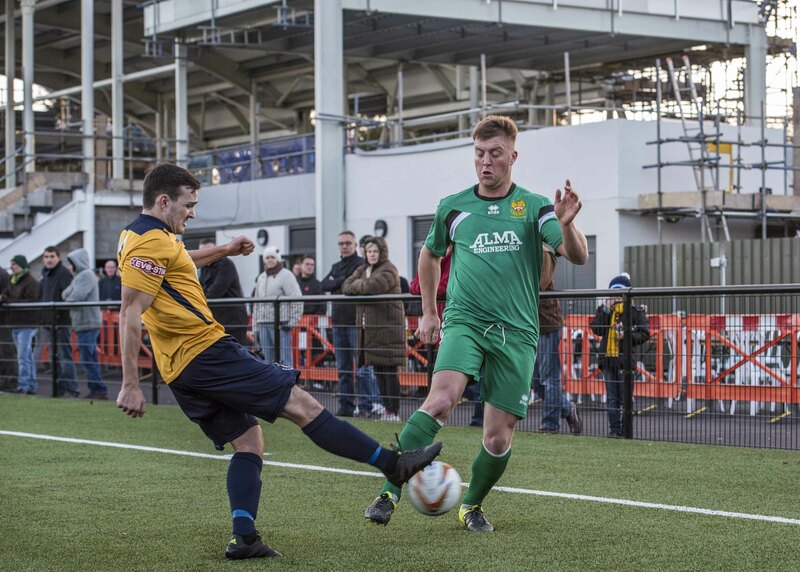 Hitchin hung on to earn a valuable win, and their celebrations at the Slough end were not entirely appreciated by the home fans, who were there in greater numbers – 648 – than during the club’s tenure at Beaconsfield. As the Slough fans went home mumbling about their misfortune, the ref, the tenacity of Hitchin’s Callum Donnelly – the agent provocateur who is invariably a target with opposition supporters – Hitchin’s power curve got back to discussing the next important topic – Arsenal at home on Thursday night and Biggleswade Town away next Saturday in the FA Trophy. It comes thick and fast in non-league football. Game of the People is pleased to announce that in the next few weeks, we will spend a month with Mark Burke and Adam Parker on the inside. Mark’s and Parks’ will be a fly-on-the-wall experiment that reveals what goes on behind-the-scenes in non-league football. Mark’s and Parks’ will start in mid-November. “Tenacity of Callum Donnelly” ! I suppose all supporters have their own understated bias about their own players.